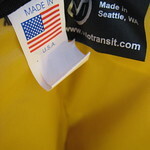 We here at BikeCommuters.com have been busy reviewing some Velo Transit – waterproof packs and panniers – all Made in Seattle. As you may have seen, our writer Matt reviewed another of the Velo Transit – waterproof backpacks and the Velo Transit Metro 20 Pannier. 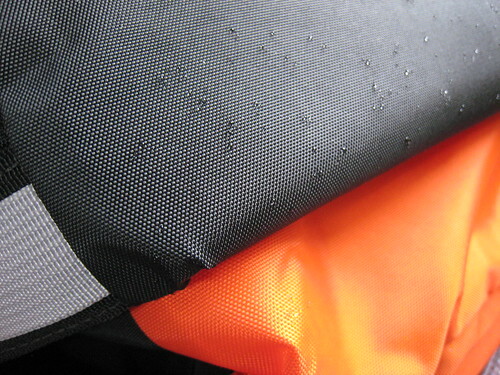 Velo Transit also makes women specific packs and sent me a women’s Module 25 Waterproof Commuter Backpack to review; they sent me a size ‘small’ in orange. Module 25 has been significantly upgraded for 2012. We improved access with the new “Slick” Roll-Top, making it easier to get in and out without compromising waterproofness. All day comfort is guaranteed with improvements made to both the 3D Mesh back panel and ergonomic shoulder pads. 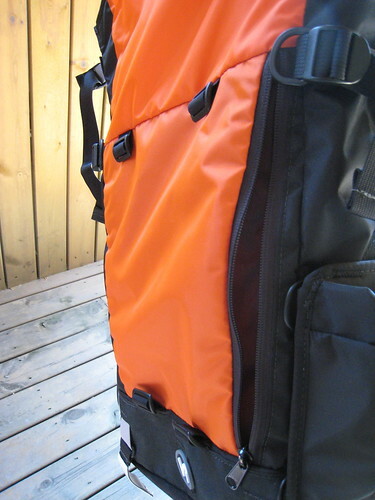 Like the 2011 version, this is the base unit of a modular bike pack. 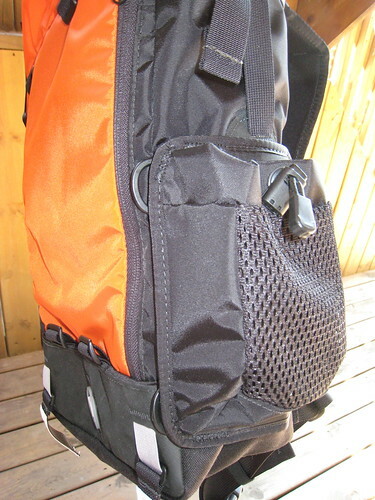 Various attachment pockets and accessories let you outfit the Module 25 for your needs and wishes. Look for these accessories to be rolled out over the coming months. Bike specific features, like blinker mounts, reflective tape and a lock pocket are standard on the Module backpack. This Slick Roll-Top Pack has an RF-welded liner, giving it the STORM-PROOF seal. A 3D Mesh-lined back panel helps to dissipate sweat and along with an HDPE Frame sheet to maintain its shape and stability under load. The Front U-Lock/ Zippered Stash Pocket gives you quick and easy access to your lock and supplies. We are sure this will be the most comfortable and useful waterproof backpack you have ever owned. This commuter backpack retails for $159.95 – midrange between their panniers and their urban backpack line. 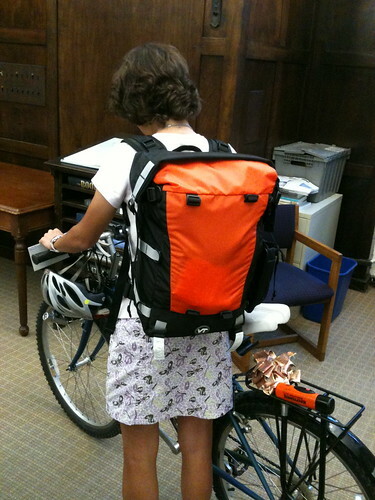 Velo Transit lists the Module 25 as one of their three waterproof packs and panniers in their women’s specific line-up. For this review they sent me this pack with the optional mesh side pocket already attached – very useful for stashing items on the fly. For me, I appreciated the bright orange color of this pack and the reflective accents and blinker mounts (yes – multiple attachments available). This pack does come in eight different colors – so there should be a color to suit nearly everyone’s preferences (if neon orange isn’t your thing). I also liked the sleek profile of this pack. Despite its ability to carry a lot, the weight remains evenly distributed and I never felt like I was carrying too much or unbalanced. With normal backpacks I’ve used in the past, I felt like the bag just kept expanding outward…causing awkward carrying issues and shoulder pains. I was able to travel light with this pack OR load it up without any weight distribution issues. On a few occasions, I enjoyed stopping by the market on the way home for a few items without worrying about having enough space for my goods. The front zippered “stash pocket” is a great place for a U-Lock and other necessities you might need to grab on the go. And the mesh padded back and straps further eased carrying a load and limited sweating. Best part about this Velo Transit waterproof backpack? It’s actually waterproof! (at least it was for the few times I was out in the rain with it). I used it in the rain on a day when I carried my laptop in it and the interior remained bone dry. 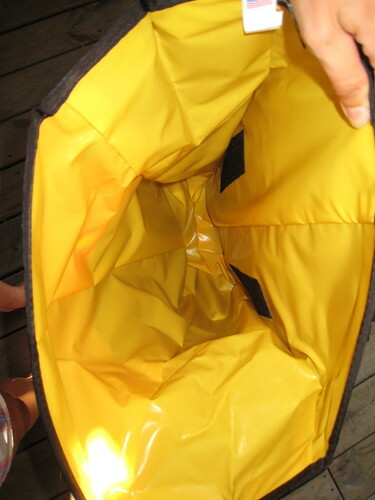 The liner is a bright yellow – which also makes it easier to find your stuff – and it’s described as “stormproof”. The top of this backpack rolls closed and cinches tight – so there are no seams for water to sneak in. The water just beads up on the fabric. I was skeptical of riding with another backpack, after suffering from neck/shoulder pain for the past several years. This backpack never me feel like I was carrying a load and never caused me any pain. There were some days I chose to ride with this pack instead of a pannier just for the ease of on/off bike mobility with the pack. Bottom line: the Velo Transit Module 25 is a quality backpack that can rival the carrying capacity of a pannier and is waterproof too. It gets my vote. 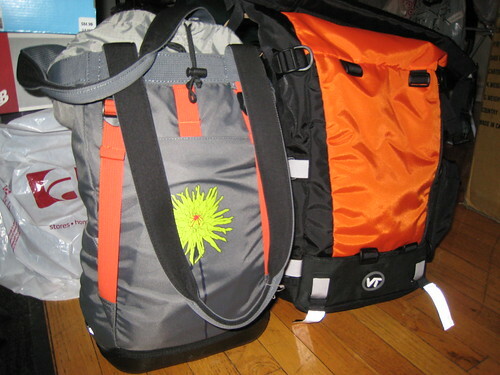 My only suggestion – consider offering an even smaller size pack for the “light” travel days. You know what’s weird? 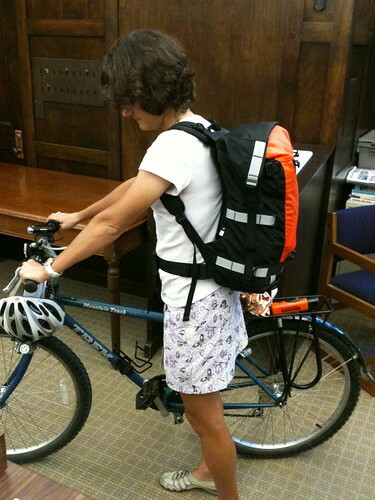 I’ve noticed a trend in cycling-specific backpacks, where they take a somewhat trapezoidal shape — and the “wide” end is at the top where it is most likely to obstruct a rider’s “over the shoulder” sight. This seems to be a somewhat recent phenomenon. I am hoping that more bag manufacturers realize that the corners of their bags have a tendency to block our view when we’re trying to scan behind us and redesign those corners accordingly…not all of us like helmet/bar mirrors. I’m going to miss this pack, too. I almost got in the shower to test this pack’s waterproofness. Now it looks as though today would actually provide the best on-bike waterproof test of getting soaked. @Ghost – yea.. why is the width at top so popular now? 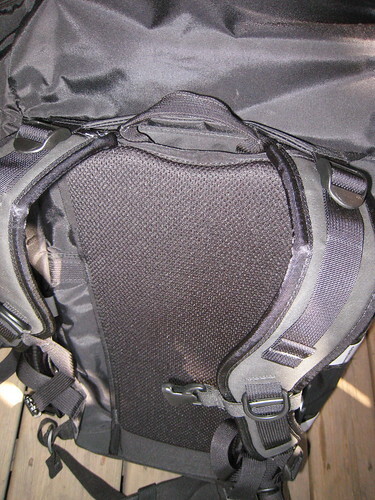 The spaciousness up top helps but it seems the packs are mimicking more of a pannier design. If you think about it, that extra space should be at the bottom — most people recommend to pack with the heaviest things in the bottom of the bag, anyhow. I’m no drinker, but our lunch group rides over the summer had a guy with an allegedly waterproof backpack full of ice and beer and the drinkers ended up sharing backpack duty so no one ended up completely soaked in the rear-end region. @bigbenaugust – I have not performed that test…. Hm… looks like I have one more test to do. Stay tuned. I’ll fill’er up with water and see if she leaks. Oooooh I love it. Checked out their site and I also love the District 30…. Decisions, decisions! Thanks for the review! @Kat – I like that extra pockets/organization at the District 30 allows, plus you still get the waterproof main compartment. It will be bigger than the Module 25 I tested, but great if you need the space. Good luck. Let us know what you decide and how you like it. 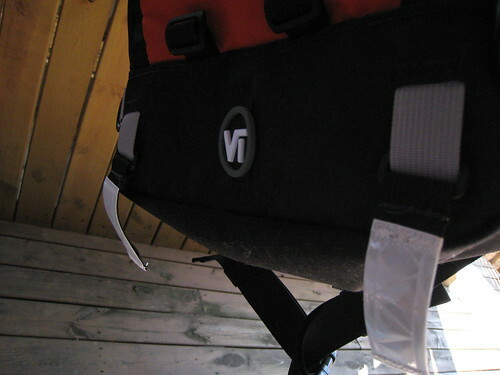 @bigbenaugust – per your request, I ran a test by filling this Velo Transit waterproof backpack with water. It held and didn’t seem to spring any leaks outside the pack. Not sure how it will perform full of ice and beer, but it holds water – leak-free.